Over the three days we spent in Princess Louisa Inlet last summer, we watched a fascinating play of light and shadow. 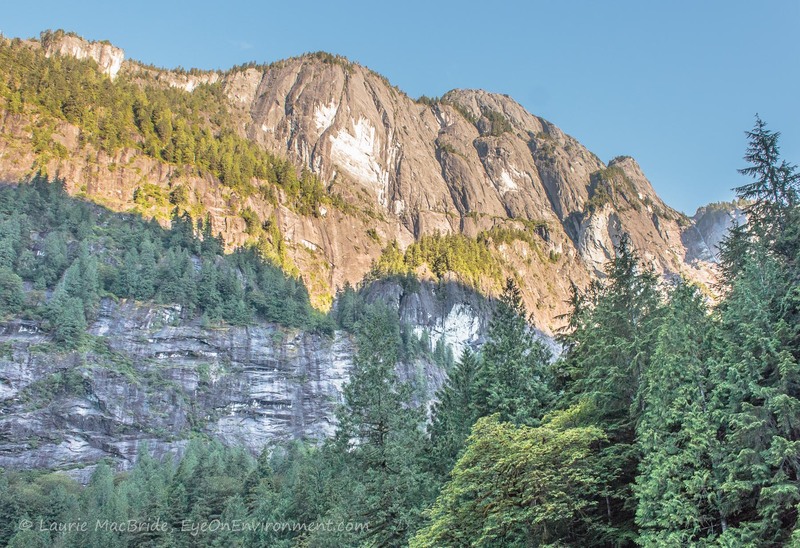 This steep-sided, narrow inlet is tucked far into BC’s Coast Mountain Range, so morning light is slow to arrive. When the sun finally makes it over the eastern peaks, it lights the tops of the mountains along the western shore first. As the daylight slowly grows, it arcs down to the lower elevation treetops, filling in the rest of the western shore and eventually both sides of the inlet. By mid-afternoon, the process starts to reverse as the sun vanishes behind the giant peaks to the west. 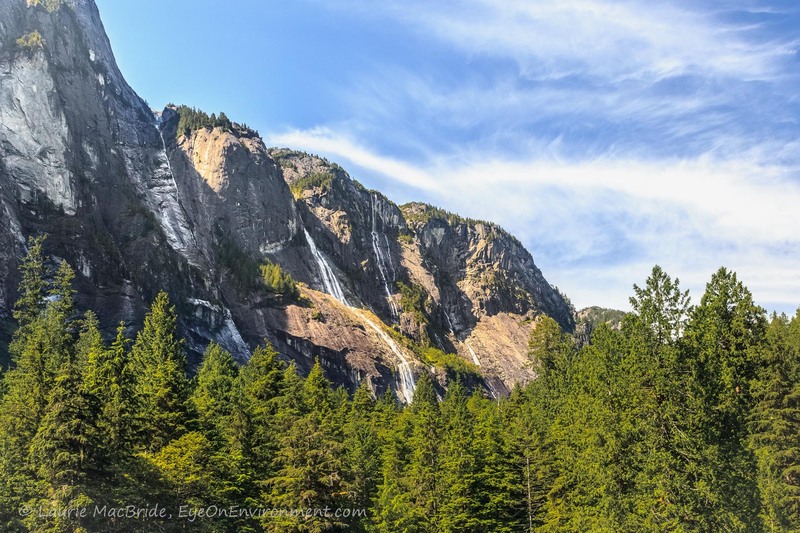 To give you a sense of scale, one of the waterfalls in the photo above is James Bruce Falls: at 840 m (2760 ft), the highest measured waterfall in North America and 9th highest in the world, according to Wikipedia. The steepness of this landscape is breathtaking – but down at sea level, it means fewer hours of direct sunlight than you might otherwise expect. Depending where you moor, you can enjoy morning light or afternoon light. We anchored just west of iconic Chatterbox Falls – the much photographed spot at the head of the Inlet which has been drawing boaters to this regal destination for close to a century. 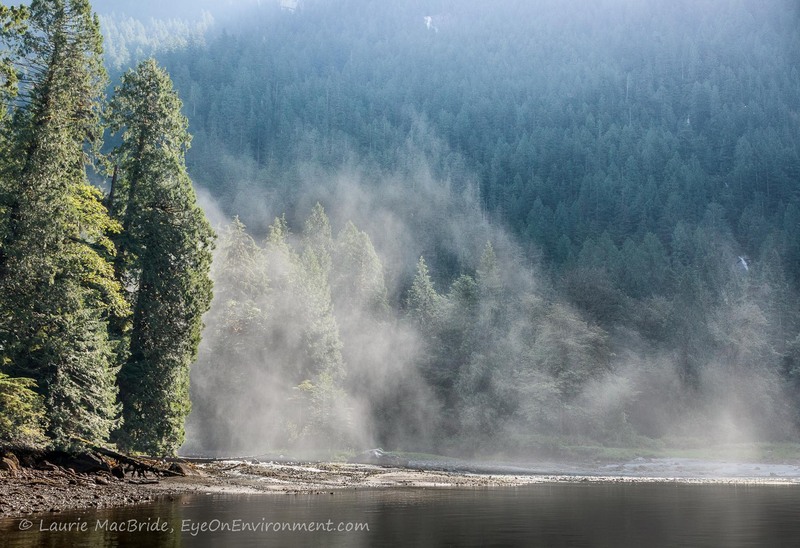 We’d had heavy rains in the spring, so by the time we got there in late June, Chatterbox was roaring – blasting huge sheets of mist out over the estuary at the head of the Inlet. When the morning sun finally made it over the mountain peaks to the east, the mist was backlit, providing a shimmering light show: perfect for viewing from our cockpit with a late morning coffee in hand. 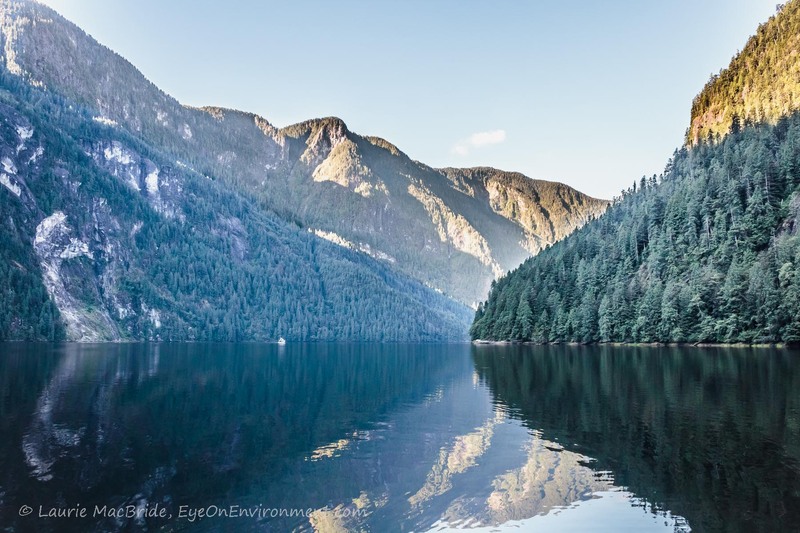 Posted by Laurie MacBride, Eye on Environment on December 19, 2016 in BC coast, Boating, South Coast & Vancouver Island and tagged beauty, Chatterbox Falls, light and shadow, mountains, nature, photos, places, Princess Louisa Inlet, waterfalls. Wow, this is one of the most amazing posts and sets of photographs I have seen that represent the epic beauty we enjoy out here on the west coast of Canada, Laurie! Excellent stuff my friend!!! Thanks for your kind words, Toad – so glad to hear you enjoyed it. Princess Louisa truly is a beautiful place, especially when the weather is good, as it was when we visited. Just exquisite images, Laurie, and I love your descriptions. What an unbelievable place and such high waterfalls! I had no idea. Wishing you a Merry Christmas my friend and many more breath-taking sights in the New Year! Wishing you the same, Sherry! Thanks for the comment, and all the best of the season to you and yours. Laurie, Beautiful pictures of a beautiful place! One of the smaller waterfalls on the north side tumbles into pools on the way down that are heated by the afternoon sun shining on the granite. I hope to get back to that place some time. Sounds lovely! We found one while kayaking there, that might be the waterfall you’re referring to – will look at my images of it and consider including in a future post. I intend to do one more about Princess Louisa…if readers can stand yet another! 🙂 Thanks very much for your comment. Thanks for the visit, Hayley – glad you like the images!